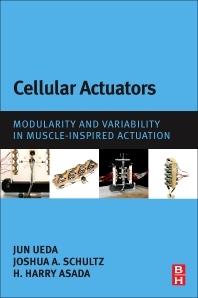 Cellular Actuators: Modularity and Variability in Muscle-Inspired Actuation describes the roles actuators play in robotics and their insufficiency in emerging new robotic applications, such as wearable devices and human co-working robots where compactness and compliance are important. Piezoelectric actuators, the topic of this book, provide advantages like displacement scale, force, reliability, and compactness, and rely on material properties to provide displacement and force as reactions to electric stimulation. The authors, renowned researchers in the area, present the fundamentals of muscle-like movement and a system-wide study that includes the design, analysis, and control of biologically inspired actuators. This book is the perfect guide for researchers and practitioners who would like to deploy this technology into their research and products. Joshua Schultz, has received his Ph.D. from Georgia Institution of Technology in 2012, M.S. from Vanderbilt University in 2004, and B.S. from Tufts University in 2002. Dr. Schultz’s research focuses primarily on soft robotics, in particular the role of small on-off cell-like units linked together by compliant material to generate motion as a whole. Because of the discretized, decentralized nature of these devices, this also involves control of quantized systems. He is also interested in properties of anthropomorphic hands and the role of compliance in grasping & manipulation. Professor H. Harry Asada is Ford Professor of Engineering and Director of the Brit and Alex d’Arbeloff Laboratory for Information Systems and Technology in the Department of Mechanical Engineering at the Massachusetts Institute of Technology. He earned his B.S. degree in Mechanical Engineering, and M.S. and Ph.D. degrees in Precision Engineering in 1973, 1975, and 1979, respectively, all from Kyoto University, Japan. He joined the M.I.T. faculty in 1982. Professor Asada teaches and conducts research in the area of robotics, bioengineering, and dynamic systems and control.